Written by donovan roche on Monday, August 29th, 2016 at 10:58am. Guns N’ Roses’ “Not in This Lifetime” tour visit to Qualcomm Stadium was late in every sense of the word. 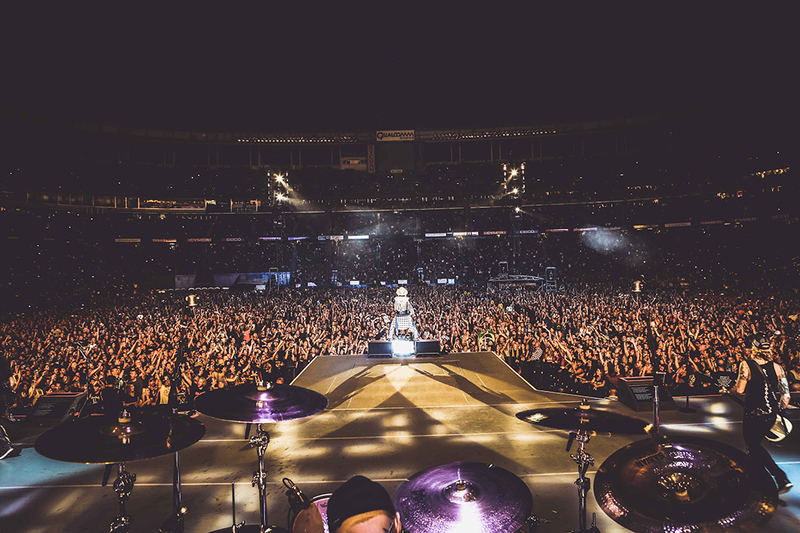 To start, fans had been waiting since 1993 (the last time singer Axl Rose and lead guitarist Slash shared a stage) for the reunion to take place, and San Diego was the final stop on the 21-city North American tour. Further prolonging things, both bands — opener The Cult, who was announced just the day before, delivered an electric though too-short set — were late to the stage. As result, the show went well into the night, with the strains of “Paradise City” hovering over America’s Finest City at midnight. The evening began with Looney Tunes theme music (perhaps a nod to how crazy it was for this to be happening in the first place? ), GNR guns shooting off, and a burst of fireworks. It certainly set the stage for the nearly three-hour sonic assault to follow. Rose and Slash were joined by original bassist Duff McKagan, who started the night wearing a Lemmy T-shirt and sporting a hand-drawn purple symbol on his bass to honor two of this year’s fallen rock icons. 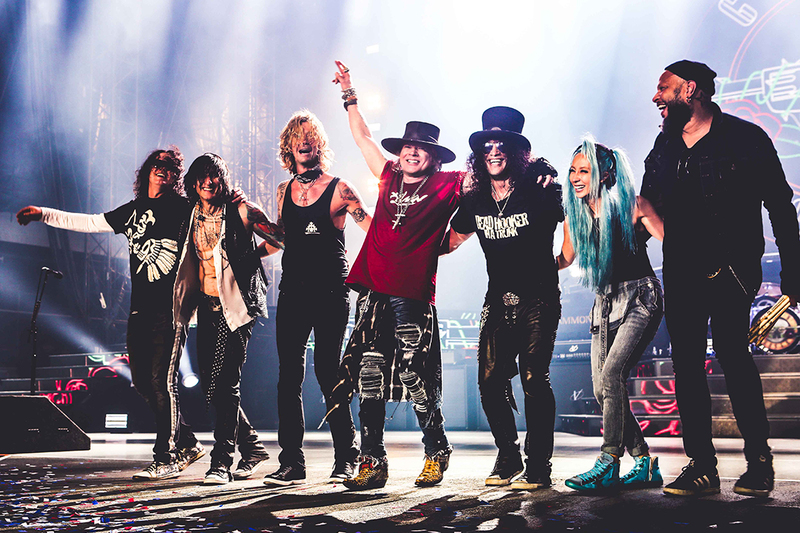 For reasons we may never know, rhythm guitarist Izzy Stradlin and drummer Stephen Adler were not part of this reunion, but respective replacements Richard Fortus and Frank Ferrer more than held their own. Dizzy Reed and Melissa Reese, both on keyboards, filled out the seven-piece. A few people showed up. The generous, 26-song set jumped around from big hits (“Welcome to the Jungle” reared its head about 15 minutes in, while “Knockin’ on Heaven’s Door” arrived near the end) to rarities (such as “Used to Love Her” from G N’ R Lies) to numerous covers that were both anticipated (Wings’ “Live and Let Die”) and unexpected (Pink Floyd’s “Wish You Were Here,” during which Slash and Fortus shared a nuanced guitar duet). Rose, who changed black cut-off shirts almost as frequently as Slash switched guitars, seized every opportunity to unleash his trademark serpentine sway during a song. He sounded best when his piercing yawp was sandwiched within a heavy song, such as “Civil War.” Conversely, “This I Love,” a ballad from Chinese Democracy, was a vocal train wreck (afterward he claimed technical difficulties). “November Rain,” which featured Rose on piano, couldn’t hold a candle to the voice heard on Use Your Illusion I, though fans appeared enthralled nonetheless. Slash fared better. Throughout the night, the cameras stayed on his skillful fretwork, from “Double Talkin’ Jive” to “Speak Softly Love (Love Theme From the Godfather),” which gave way to a jaw-dropping solo segueing into “Sweet Child O’ Mine,” one of many songs coming from the band’s landmark 1987 debut Appetite for Destruction. By the end of the night, this writer had a whole new appreciation for the guitarist’s gift. But was it enough? Was it all, the high points and imperfections, worth the wait? During the band’s four-song encore, as they played “Patience” — something their fans had to have plenty of the past 23 years, eight months and many days — the answer was a resounding, ear-ringing yes.